Today is the first of July! (or Shichigatsu in Japanese) This is so exciting, I’ve been waiting for these summer months all year! There are a ton of new bugs and fish to catch, I’ll list them all a little later on. Today started out great! Curly’s house is gone. I am going to be putting down tiles where houses were from now on, so I don’t plant any important flowers over an area where a house might appear! Hmm. Well, at least it’s not THAT bad! 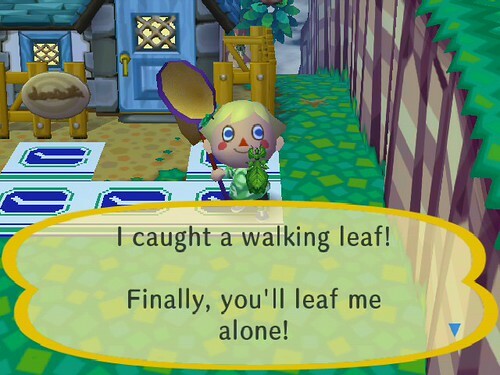 Good luck finding a spare clover in my town though… lol! I hope I didn’t leave anything out! There’s a TON of bugs to catch, so get out there! Plus you can get a tan when you’re out in the sun in Animal Crossing! There’s not quite as many new fish, but those huge fish are worth at least 10,000 bells each so it’s definitely worth spending a day at the beach!